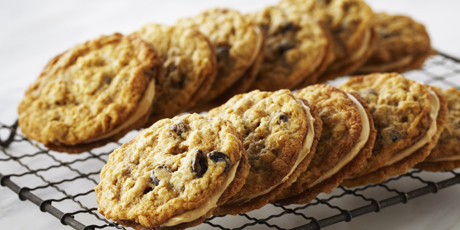 This snack, courtesy of Anna Olson, is complete with oatmeal raisin cookies and a peanut buttery filling and will delight young and old alike. 1. For the cookies, preheat the oven to 375 F and line baking trays with parchment paper. 2. Cream the butter, granulated sugar and brown sugar together until smooth and light. Add the eggs one at a time, beating well after each addition. Stir in the vanilla. 3. In a separate bowl, stir the flour, cornstarch, cinnamon, ginger, baking soda, salt and allspice together. Add this to the butter mixture and stir to blend. Stir in the oats and then add the raisins. Drop the cookies by tablespoonfuls (or using a small ice cream scoop), leaving at least 2 inches between the cookies. Bake the cookies for 10 minutes (the cookies may look underdone, but will set up to be nice and chewy once cooled) and allow them to cool on the baking tray. 1. To prepare the filling, beat the peanut butter, butter and icing sugar until smooth. Spread a layer of the filling one the bottom of one cookie and sandwich with a second cookie. 2. The cookies will keep for 3 days (filled or unfilled) in an airtight container.